H.R. 620 and similar ADA notification bills are gaining more steam in Congress than ever before. If any passes, it will have a devastating impact on the ADA by denying people with disabilities the power to enforce some of its requirements. DREDF and other disability rights advocates are working—and need others to join them!—to counter the business lobby, which wants to make it much more difficult to attain accessibility when businesses such as stores, restaurants, hotels, etc. disregard their ADA responsibilities. What would H.R. 620 (ADA Education and Reform Act of 2017) do? Remove any incentive for voluntary compliance. Require a person with a disability who encounters an access barrier to send a letter detailing the exact ADA provisions that are being violated. Reward non-compliance by allowing businesses generous additional timelines, even though the ADA's reasonable requirements are already over 25 years old! 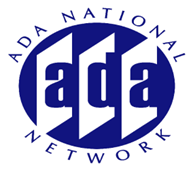 Perpetuate the myth that the ADA benefits unscrupulous lawyers rather than the truth: that the ADA is the most important civil rights law for people with disabilities. Ignores the extensive, free educational resources already available today to any business on how to comply with the law. Join us for this webinar to learn more about what is happening with this quickly-moving bill, and how you and others can get involved.